The McClain Lady Tigers varsity Volleyball team poses for a group photo with their coaches in the McClain High School gym. The Lady Tigers varsity Volleyball team from McClain has high expectations for the 2018 season following a less than ideal season in 2017. The Lady Tigers will be looking to leverage their experience as a team and with second year Head Coach Taylor Alsop. McClain’s coach makes no secret of her desire to elevate the Volleyball program in Greenfield to a place where they compare favorably to other local programs. “My expectations for this year are a lot higher than last year. I expect more from the girls in every aspect, because they have had me for a year now. I come from a town that has a rich volleyball program and want to work towards building that in Greenfield,” Alsop told The Times-Gazette. The McClain girls will rely on two members of the 2017 squad for leadership in 2018. The Lady Tigers’ coach feels that the major difference for the team in 2018 is the experience of her players including four returning seniors. Despite an 8-15 record and a 3-7 finish in the Frontier Athletic Conference (FAC) the Lady Tigers will not be making adjustments to their game plan this season. Alsop wants to take her team deeper into tournament play than she did a year ago but, she knows that for that to happen her team will need to get better from the first game to the last. “We’d like to go farther than what we did last year. We understand that it will take a lot of focus and we need to constantly work towards getting better every game. The girls want to leave something behind for the teams that follow,” Alsop said. The Lady Tigers have worked hard to prepare for the season and the support for the team has grown according to Alsop and she would like to see that continue. “I’d like to encourage them to come out and check out the team. The girls have worked hard all summer in the gym and weight room. 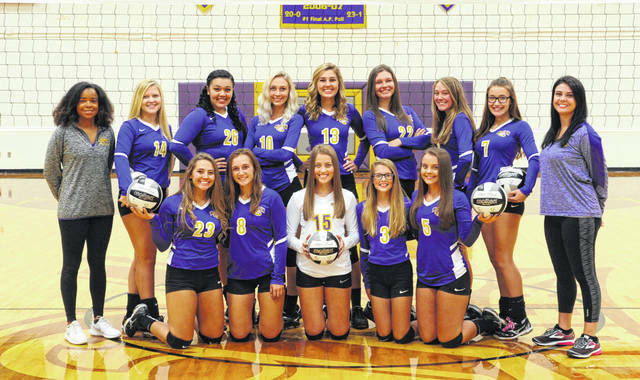 We have received more support this year than last year and myself and the girls would like to see that continue to grow,” Alsop told The Times-Gazette. Alsop’s team has three juniors on the squad this season and they know what there roles are on the team. “My juniors are Cierra Bolender, Kaleigh Easter, and Ashley Hardesty. Easter will be setting for us this year and Hardesty will be playing back row and may hit for us as well,” said Alsop. McClain will also be adding several younger players to the varsity team in 2018 and the Lady Tigers have already seen the benefits early in the season. “We have several younger girls coming up to our varsity team. We have four sophomores (Maddy Crawford, Jaelyn Pitzer, Brooke Beatty, and Kyndall Penwell) coming up. Maddy Crawford and Jaelyn Pitzer have stepped up to play key roles for us. Freshman Iva Easter has shown that she can be a key player for us as well,” Alsop said. August 28 – The Lady Tigers open the FAC part of their schedule with a trip to Jackson for a match against the number two team in the league in 2017. September 11 – McClain returns to their home gym for the first time in five games to take on the defending FAC champion Lady Cavaliers. October 4 – McClain will welcome the Lady Indians of Hillsboro to Greenfield for their second cross-county matchup of the year. The mix of returning players and young upcoming talent will bode well for the Lady Tigers in 2018 and has the chance to propel them to a top three finish in the conference. Expect McClain to finish with a better overall and conference record in 2018 and look for them to win at least one game in tournament play. https://www.timesgazette.com/wp-content/uploads/sites/33/2018/08/web1_McClain-Volleyball.jpgThe McClain Lady Tigers varsity Volleyball team poses for a group photo with their coaches in the McClain High School gym.